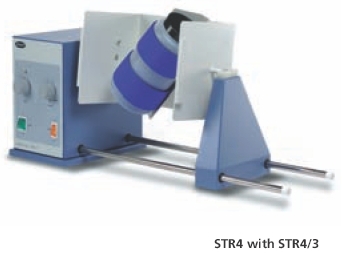 The STR4 rotator drive unit is used in conjunction with a wide range of drums designed to take different sizes and types of vessels. The five drums are designed to give different mixing actions and are listed on pages 38 to 40. 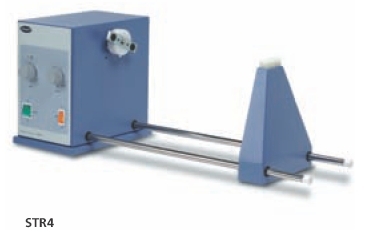 Speed of rotation is variable from 6 to 60rpm for a range of mixing applications. For added convenience a built in analogue timer can be set from 10 to 60 minutes. Alternatively the unit can be set for continuous operation. 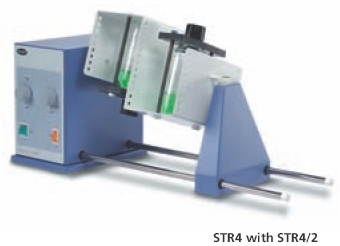 Designed to rotate test-tubes in an end-over-end movement. Comprises a square metal drum which can accommodate a choice of plates fitted with tube clips. Up to four plates can be mounted on the drum. Easy fitting via a push button mechanism. 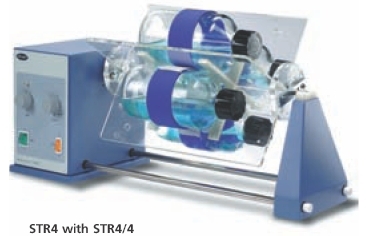 This drum accepts 2 x 250ml conical flasks or reagent bottles for end over end mixing. The samples are securely held in place by a collar that fits around the neck of the flask or bottle and is secured by two washers. Drum holds the vessel at a 45 degC angle so it is rolled and turned end over end at the same time giving a vigorous figure of 8 mixing action. The sample container is retained by a strong Velcro strap. Accepts almost any container including reagent bottles, powder jars and paint tins up to 200 mm in length and 120 mm diameter. This drum consists of a four segment Perspex cradle. Each segment is fitted with a fully adjustable Velcro strap to hold bottles and other containers up to 120mm diameter and up to 300mm in length. 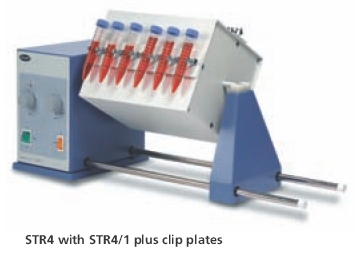 Designed for thorough end over end mixing of 1.5ml microcentrifuge tubes. Four racks (included) can be held securely in the drum. 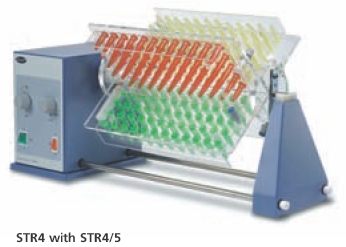 Each rack can accommodate up to 60 microcentrifuge tubes, making this unit ideal for a high throughput laboratory.